The winter solstice on December 21 officially ushers in a new season, but it also signifies the shortest day of the year. While long nights set the perfect scene for staying in by the fire (or throwing a glamorous cocktail party), the early darkness can make even the most well-decorated rooms feel a bit claustrophobic. Though every day after the solstice brings another extra minute of daylight, you can brighten your space significantly right now with a few clever accessories. Namely, mirrors. Integrating a few into your décor helps reflect light that makes a room feel open and spacious. Looking for the perfect mirror for your style? Here are our favorite picks currently available for sale at Sotheby’s Home. Crafted from giltwood, this mirror perfectly balances a larger mantel, or even a large-scale buffet or sofa. The elaborate carvings draw the eye around each panel, creating a focal point like no other. When light hits the angled panels that make up this mirror, the effect is positively dynamic. Designed by Neal Small, the “Prince of Plastic” who revolutionized the way acrylic materials could be used in furniture and accessories, this circa-70s mirror strikes the perfect note between vintage and contemporary. Clean lines and an unobtrusive black-glazed nickel frame makes this mirror a timeless addition to your décor. It can work virtually anywhere in a space or in an entryway, in a powder room, above a mantel, or above a console table in a hall. If you’re in the market for a mirror that makes a statement, look no further than this mirror. You can pair it with similarly contemporary pieces, or contrast the dramatic silhouette with more traditional furniture. A leaning mirror is the best way to maximize light, it has a large expanse of glass, but it’s also very easy to style. (Just find an open spot on the floor and wall, then lean.) The mirror also reflects a space from floor to ceiling, so it’s also a great way to highlight a fabulous piece of art, lighting, or furniture on an opposing wall. 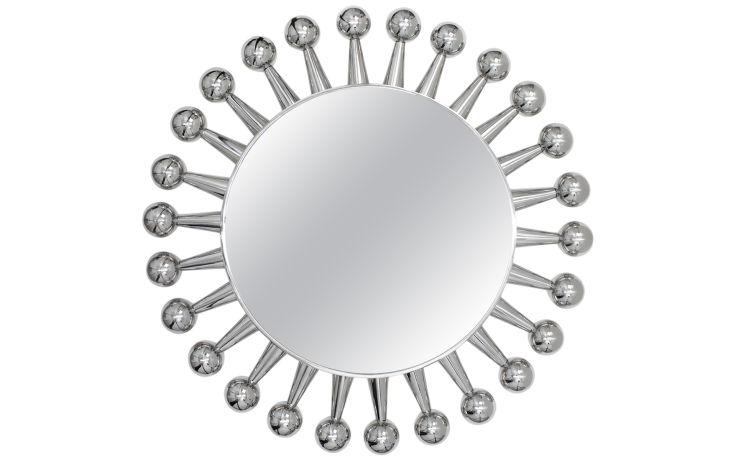 An updated take on a sunburst mirror, this bold design by Jonathan Adler is the definition of whimsical style. The polished nickel spheres function a bit like mini fish-eye mirrors, creating new perspectives with every glance. Brighten up a room in an instant with this captivating antique mirror. (Though it does have a ring in the back that allows you to hang it on the wall, the base provides enough support to let it stand alone.) The circa-1930s mirror was likely designed for a vanity, but it can go wherever you need a little extra light and interest.